Clare Ozich: Today Green Agenda editors Clare Ozich and Simon Copland are talking with Amanda Cahill, Director and Founder of the Centre for Social Change and a new project called Next Economy that we will talk more about shortly. Welcome to Green Agenda, Amanda. Amanda is passionate about engaging people around issues that are important to them and is particularly interested in working with people wanting to explore alternative approaches to local economic development both within Australia and internationally. And it is this area of alternative approaches to local economic development that we are particularly interested in talking to Amanda about today. So Amanda before we move on talk about some of the actual projects you have been involved in and your plans for the future, I am keen to talk about your theoretical basis and the philosophical approach you take to your work. A key influence on you has been the work of JK Gibson-Graham, the feminist political economists and economic geographers. Their best known books are, for people that don’t know them, The End of Capitalism (As We Knew It); and A Post-Capitalist Politics; and most recently Take Back the Economy with Jenny Cameron and Steven Healy. Can you tell us a little bit about their work and what you take from it and what it means to you? So what they did was undertake a mapping exercise and broke down the economy into its parts. So if you think about the economy it is how do we transact, how we organise around ownership of resources or decision-making around resources, how we organise labour. They took those elements and said if you break down the economy into that – how are all the different ways that people are doing these things across the world. Is it just capitalism or nothing? Or is there something else going on? And what they saw was a spectrum. We have a market-based system that operates in different ways around the world. But there are also a lot of other practices that we engage in that don’t fall under the label of capitalist practices. For example you can exchange goods and services for cash in a capitalist market-based system or you can barter or you can steal things, or do all different kinds of exchange that have a different logic, a different relationship, a different ethic to it. 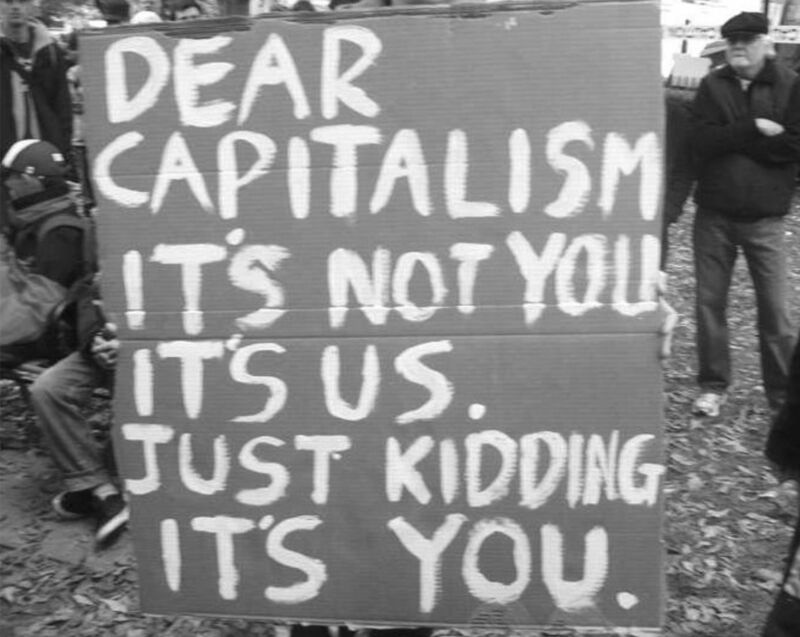 If you look at the economy that way, the capitalist system is the tip of the iceberg and there is a whole lot of other things going on, even in suburban Australia, that are actually keeping our economic systems going. There was a study – I think in 2011 – that was showing that even today something like 80% of the world lives on less than $10 a day, which doesn’t necessarily mean they are poor, it means that people are engaging in a whole lot of different economic practices to get what they need to survive. When you can see that it opens a whole lot of different possibilities for how we can act as economic actors. there are also a lot of other practices that we engage in that don’t fall under the label of capitalist practices. Clare: One of the thing that I really like about their work that you touch on is that it opens up all these possibilities so that instead of seeing capitalism as this sort of monolithic hegemonic force that is going to require some kind of equal force to bring it down; big revolution to come and crack it all open. They are focused on drawing out all the different economic relations that surround us and it is about fissuring and fracturing and opening up of spaces. I find it a hopeful way of looking at what can come next. Simon Copland: That is what appeals to me as well. A lot of anti-capitalist material is very difficult as it comes across as we have to do this huge massive thing, and something that is completely impossible to achieve. That is something that I hear a lot doing anti-capitalist work – that it is just unachievable; that capitalism is so dominant that we cannot overthrow it. Whereas if you start to understand it as particular sets of economic forms but not ones that are the only economic forms that exist then you can start to find where the cracks are in the parts that are very problematic and start to look at that instead of suggesting we have to overthrow everything in the world that ever existed. I think that the other element of that it also says to people you are not going to have to change everything about what you do in order to change the world. 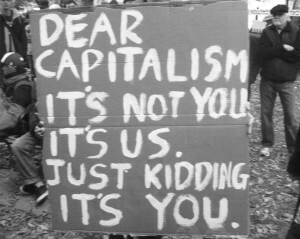 We are not talking about you changing your entire lifestyle because in fact not everything is the capitalist economic system. It is about finding the parts of the system we need to challenge instead. Amanda: There are a few points in what you just said Simon. One is – and this what I looked at in my PhD, a Foucaultian analysis – if you look at the economic system as a set of practices and a set of relationships there are decisions that are being made that this system then gets reproduced and certain relationships of power get reproduced through the way we interact and the decisions that we make. So in a way that is where the fracturing and the opportunities open up for different kinds of decisions to be made. That brings back in some agency and brings us back into the picture. 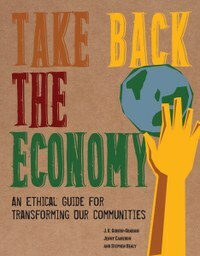 Instead of talking about the economy as something big and outside of ourselves, it is actually that we are participating in this all the time and we have different decisions and different options available to us about how we produce things, and how we exchange them and how we consume and how we make decisions about resources. But so often I think even more these days people think of it as this economic system that some people have all this power and there are no opportunities to intervene in that, and I think this brings it back in. It also bring in ethics of decision-making into that picture so we can actually start to unpack who is making these decisions and what are the ethics behind that, and can we just leave it to the market. What is the market? Who is the market? So it opens up very different questions and I find it really exciting. Simon: How does this interact with discussions around power in the sense that what you are talking about there could result in a situation where there is that individual change-type approach to social change that suggests that if we all just change some of our decisions we can all sort-of opt-out of the capitalist market. It is a potential logical outcome. How do we engage with the fact that we all engage in capitalist and non-capitalist economic decision-making whilst also acknowledging the power of being forced into particular economic circumstances and situations? How do we merge those two together? So I think it does bring it back to where do we have some sense of control but also really political discussions about where have we lost control, where have things become so centralised and how did we let that happen and who made that decision and shouldn’t the government be legislating around this. So it does bring the “who” back into it but not just a “it is our fault”. It is actually saying wealth and power has been concentrated. This hasn’t always been the case and we have to think about when did this happen and how did this happen, which then leads into discussions about the 1% and the Occupy movement and all that kind of stuff. So I think it actually leads to more interesting discussions about power than there sometimes is in the anti-capitalist conversation. Simon: This is a story I come back to but it reminds me of a tutorial at university I once had. It was in an anthropology class where we did a reading about a group of people in South America or Central America who lived largely on subsistence farming of turtles in the area. Then a big company came in and realised the turtle meat would be very valuable for the company and started to overfish them. They hired people from the community to participate in the process but what happened was people ended up being much much poorer physically and in terms of their nutritional situation. I remember having this huge debate with people in my class with me saying what happened was extremely bad for this community and people saying “no no no they have all this choice, they can now go to shops and buy all of this food”. And the weird ideology around this idea that you have choice, but you have no money to participate in this choice, and you can see the power situation of a community that had their local economy taken away from them and now struggling to deal with that situation. You could blame them for accepting these companies to come in but I think it is much more complex than that and it is much more complex to think about how to go back from that process as well. That might be a bit of a tangent. Amanda: It ties into the work I have been doing since 2003 in the Asia-Pacific region, which is if you start with the premise there is diversity in economic practices including so-called traditional practices that are actually very invisible. I am working in places like the Philippines or Timor-Leste or Fiji and they are taught the economy is the money-based economy, and then there is the other stuff they just do. But actually the subsistence part of that equation is how most people make a living. So if we bring that back into the discussion and get people talking about when do you use that practice, that communal sharing, or communal production, communal harvesting of things, or make decisions about communal resources versus other resources, when does cash get involved. People are switching into very different rules of the game and there is very different obligations and different groups of people have different rights over different resources. By actually looking at that and looking at how people make decisions about that and then going if you can build on those practices that you use for communal structure to actually start a business. If you can pool your time and effort for harvesting can you pool your time and effort to start doing some production that you can then sell for cash. What we found was that when people are doing that and building on those so-called traditional practices, they make very different decisions about the money when it does start flowing. A lot of it will go back into a communal fund or into their church. The decisions they make about the resources to make sure they are there for the long term are different from a commercial enterprise, which just turns into a business, which is just extracted. For example, one group of women we helped started a ginger tea business. They were grandmothers. They were subsistence farmers. They were growing ginger in the back yard. They could not sell it at the market because there was cheap Vietnamese ginger coming into the country. So they decided they would make a ginger tea. When they went to the market, everyone at the market was like “yeh if you make it we’ll buy it because we want to support you because we are related to you and we know your tea will be good”. So they bought sugar with their bus fare, walked back up the hill, went into their own kitchens, made their first batch of ginger tea with what they had, went back the next day, sold it. They then negotiated with the community to use the community hall as their production centre and in exchange they said “we’ll make sure money goes back into the community fund”. But they also decided to do things like stay in part time employment rather than full time employment so that other people in the community could have work. So there were all these benefits that went back into the community. They ended up employing 65 people. All that money was re-circulated and kept in that community. They decided they only wanted part time employment because they were grandmothers, they were farmers, they were doing childcare and they wanted to keep doing that. So it is a very different decision-making framework. So we can do it but it takes a process to think in that way, rather than just giving over all of our power and saying this is how you do business and getting into that extractivist way of thinking. Clare: That process you have just mentioned, Amanda, that is one of the things that you go and help communities with – putting this theory we just talked about into practice. Can you tell us a little more about how you approach going into communities, whether they are in Asia or here in Australia, and what you do and how you get communities having these conversations? Amanda: First of all we only go where we are invited. That is really important. We are invited in by two different communities: one, where they are in a really dire situation and everyone else has given up on them and they cannot attract external support or investment so they are looking for an alternative approach; others are more pro-active about wanting to build a new economy and an ethical economy, and what would that look like. The approaches we use – there are three things – first of all we train up people in that community to do their own economic research, to map out their economy and have conversations locally about what do they want out of the local economy, what do they value in it, what do they want for their future, what are the opportunities they want to explore. Locals doing their own action research on that process. Secondly, we use a strengths based approach. Instead of just focusing on problems, which is what normally happens – we have all this unemployment, we have no money etc etc – it is actually getting people to look their research for what industries do we have, what resources do we have, how do resources flow in this community, how does it work? It is starting with what people actually have and then building on that, which I have found leads to economic solutions that are actually much more appropriate for that local context because they are building on what they have. It is not they have to learn something completely different or attract all these resources and knowledge from outside. They can just start with where they are at. The third part is working with the diverse economies framework. So challenging people to think about all the different kinds of economic practices they are engaged with. So in Australia it could be volunteer labour, it could be co-operatives, it could be a whole lot of things that we see as fringe but actually when you look at local economies there is a lot of things going on that are economically really important because if you took them out the capitalist system would not actually be able to survive. If you think about it, for example, if we had to pay every volunteer in Australia for their time, all the people that work in schools and hospitals all over the place, the economy could not afford it. Simon: It is an interesting part of capitalism in that there is a lot of free labour. Domestic labour is the other perfect example of that; something that capitalism refuses to pay for but also would not survive unless people did it for free. All this work that we undervalue in our society because you don’t get a pay-check for it but is integral to the survival of our society at the same time. Amanda: Differently valued and differently paid, like social enterprise for example. A lot of people could write that off as just purely capitalist but it is not because different decisions are made, different pay rates are made. It is a different logic coming into it. We need to be specific about the different forms. Clare: When you talk about a local economy, how local is it? How do you define what your local economy is? Amanda: I don’t! I don’t define it! How long is a piece of string? I am talking about it in terms of facilitating local planning processes so I let people define that for themselves. For example, in some areas I will go in because I am employed by the Shire Council to lead an economic planning activity but when I go in there might be four towns across this very big area of Australia and they see themselves as very separate. It is about having the conversation about boundaries, how do things flow, who makes decisions about resources across that community. So I work with the locals around what they think. It is about sometimes facilitating discussions between groups around where those boundaries are as well and bringing people together. Simon: In practical terms, when you go into a local community – sometimes you might be hired by a Shire Council – but when you are talking about a local community, who is it that is inviting you into these spaces in the most often cases? Amanda: It really depends. In overseas work it is often NGOs who are doing livelihood work, or trying to create jobs or wealth. Or they might be interested in starting community-based enterprises. In using those three approaches – action research; strength-based approach; and diverse economies – it is to identify economic opportunities for starting a business, for creating jobs or some sort of economic activity. So it is who is interested in that – it might be NGOs doing that kind of work overseas or in Australia, it could be in Australia local governments interested in the process. It is also increasingly environment groups who are thinking about a future beyond fossil fuels. I have been invited into areas where coal and gas are an issue and locals on the ground are getting a sense, especially with coal, that it is in decline and they are starting to freaked out about the opportunities are beyond that. So I am going in and going if you want to start thinking about this process here are some steps you can take and here are some examples around the world where other communities have been pro-active around building a different kind of economic future. It is interesting because government – and I have been talking to different people in government – they are sort of a bit shy about talking about a future beyond fossil fuels and they are using people in coal areas as the excuse not to be taking away people’s jobs. But on the ground those people with those jobs are actually kind of angry that nobody is talking about this and starting to plan for the future. They are saying, “where is the investment in infrastructure in regional areas?” “Where is the next industry?” “Where are we going to get a job?” “My son has just finished an apprenticeship. What is he going to do now because the mines are closing down?” That is the stuff I am really interested in working on now is that work, either with those communities around coal and gas or rural communities that are also doing it really tough and are looking for new kinds of economic opportunities in a zero-emissions economy. Simon: It is an interesting element the environment movement being very active in that space because the traditional environment versus jobs idea is clearly slowly being broken down – the idea these two things are opposed to each other. I guess that is integral to the idea of thinking about a new economy in many ways, changing this dynamic that you either have a healthy environment or you have lots of jobs. The fossil fuel stuff is a real part of that. Do you have any reflections on that? What are the economic practices that actually do provide for people but are actually also are ecologically resilient and balanced. Amanda: This is a discussion that is happening all around the world at the moment around what would a new economy looks like. This is my fundamental question – what do economic systems that are good for people and the planet look like? We have to get past the jobs versus the environment thing because it is false. We are completely dependent on our environment. We cannot exist beyond that. What are the economic practices that actually do provide for people but are actually also are ecologically resilient and balanced. I think the climate debate, especially post-Paris, is really pushing that agenda a lot more and is creating a different kind of space for that conversation. Unions as well. Unions and environment groups are starting to have that conversation. Clare: I am here in Melbourne where the French company that bought the Hazelwood power station is looking to close it down next year. This is a decision that has been coming for a long time. Hazelwood being Australia’s dirtiest coal-fired power station. From the reports I have read one of the reasons the company is looking to close it down is that the maintenance costs are too high, it needs too much work to meet appropriate standards. So although the decline of coal is a big factor, big companies also make decisions, and governments, make decisions that affect industries in a significant way for many reasons and often quite quickly. So again here in Victoria we’ve got the car industry closing, and we’ve got communities in the next couple of years looking at significant transitions occurring in terms of some of their major employers leaving. If you think about Hazelwood and the Latrobe Valley they’ve had it tough for a while. The first kind of big transition that happened down there was when the state electricity commission was privatised, and that ripped the community apart. Now they’re looking at it again with the decline of coal. So, reflecting on that broader point, this is happening all over the place, around the world, but quite specifically here in Australia. I think that’s very much that these are decisions that we could have planned for, or have known were coming, or at least considered likely that these things were going to happen, and that sense that we can kind of just let it be until the last minute and then somehow expect that the state will just come in and magically fix it, as opposed to this kind of alternative process that you’re talking about which is much more encouraging. Simon: It’s interesting in that, and I’m not across the mechanics within the Victorian Government, but people within the environment movement and the unions have been aware that what’s happening in the LaTrobe Valley with Hazlewood as something that is coming. It’s a decision that’s been around for a long time, and in many ways it’s been the community that’s been responding to that pending decision a lot more strongly than the Government or industry who have been clinging on to the coal industry as much as they possibly can. It’s a focus on community, that is, the people are saying we have to change, we have to do something about this, because otherwise we’re all going to end up with no jobs and that’s not what we want. I think that that’s just an interesting observation. Amanda: Yeah. I think it was Polly Higgins who draws the parallel with the abolition of slavery, in that all the big slave owning trading families we’re all like no, no, no, no, no, no this is never going to happen and fought it tooth and nail. Because while you’ve got a system in place and it’s cheap to keep it going and you want to keep that going as long as possible to make as much money as you can. Meanwhile, in the background, history shows us they were moving their money long before the end of slavery came, they were investing their money in the next best thing. So you know, it’s the same. I’m a bit worried at the moment, not the fact that people have been asking for a transition plan and no response, or very little response. The Victorian Government does have a transition fund, there are some moves to think about it, but not enough anywhere. The thing that worries me is some of this discussion getting co-opted by other interests. So we’re seeing for example in the Latrobe Valley it’s all about, okay, maybe coal fired electricity is going to shut down, but we still have coal, so let’s find another use for coal. Coal is good for fertilisers and coal is good for all other sorts of interesting things, instead of going we don’t need that anymore, we’ve got better options and better solutions for ways forward. Or gas as well. So we’re seeing in Queensland a reemergence of the narrative that gas is a transition fuel, which I though had kind of disappeared, but all of a sudden it’s like “oh well look what happened in South Australia, we can’t leave ourselves vulnerable, we need to transition to gas”. It’s like, we don’t need to transition to gas, we can go to 100% renewable and we need to plan for that if it’s going to happen. It’s totally possible. So we’ve got to be really careful about that as things become more urgent the story not getting co-opted and manipulated. Because we can’t afford it. Like climate change, we know what we need to do for climate change and we know it’s possible technically, we’ve just got to make it happen. And there are economic opportunities involved in it as well if we are proactive in it and get ahead of the game, but Australia is behind at the moment. Clare: And there’s something in there too about the relationship between people in a community and these other interests. So they are most likely going to be corporate interests and possibly government interests. So there is something in there too about how we can use this as an opportunity to reinvigorate democracy, for want of a better term, but reinvigorate the sense that people in a community do actually get to have a say over their lives in a community, both individually and collectively and that, so we’re not just people who have to sit around waiting passively for the government to make a decision, or some other interests to come in and tell us what’s best. We get to be really actively involved in making, going back to the beginning of the conversation, actively involved in making some of these decision. It’s an opportunity to kind of reinvigorate that as well. Amanda: I was just going to say, absolutely. The thing that worries me, or the thing that motivates me to set up another organisation, which we haven’t talked about yet, was having gone up north last year. I went up to interview twelve people in the Mackay/Whitsunday region. By the time I got off the plane there was seventeen people lined up for interviews, but the end of five days I’d spoken to 52 people, because the phone was ringing off the hook. People saying you’re here can I talk to you, but don’t tell anyone. Don’t tell anyone I’m talking to you, I don’t want to be seen as anti-coal. And people were crying. I spent two hours with people pouring their hearts out, worried about what was happening to their communities, completely disempowered like they didn’t have control and they didn’t know what their options were. It was 52 people in five days and I came back to Brisbane and I was thinking that this is the sort of stuff that comes out of the mouths of farmers in India who are having their land taken over by big industrial companies for sweatshop factories, or in the Philippines. And I was thinking why is it that people feel so disempowered here, and there’s a space here to answer that. During those conversations I was saying, do you know other communities are trying out different things such as ‘blah blah blah’ and people went ‘what, I’ve never heard of that’ and there’s a space in there. People have to know what their options are, because if they don’t, and this is what happened, a week later I switched on the news and they had the biggest Reclaim Australia Rally in Australia that the local MP was leading in Mackay. And I thought ‘if we don’t have answers for this they will get and they will get active in some interesting right wing groups and voting for the Pauline Hanson’s of the world, because they don’t know that they’ve got any other options. That’s the task at hand and that’s what I’m really interested in, working with communities to scope, there’s a range of different options available economically but you’re going to have to get more involved, what does that look like, how are we going to build capacity to take action on that in the face of a Government that is going to be slow around this and it’s not going to be obvious but you can do it because other communities are doing it. And to start to hook those communities up together so they can support each other more, so they don’t feel really alone in this. Because if we don’t answer that, One Nation will. Or other parties will. Simon: That sounds like a good time to talk about the new economy movement and we know that you’ve just come from the US where you went to Common Bound, which was a conference put on by the New Economy Coalition in the US. So maybe you could tell us about that and you’ve mentioned briefly there, which I think is called Next Economy if that is correct, so maybe we could tie in these conversations about what happened in the US with what you are planning into one question? Amanda: So Next Economy, the aim of that organisation is to look at what the economic opportunities are in moving to a zero emissions economy. So I want to make sure that people, individuals and communities are looked after as we move through this transition, because I see it as inevitable, it’s already happening, whether, people are still debating the need for climate change action, whatever, it’s happening, it’s going to have to happen. It could be really messy or we can start getting proactive and have a more orderly planned transition and actually get ahead of the game with this. So I’m working with communities affected, or impacted by the fossil fuel industry in different ways, so coal and gas affected areas. I’m also working with rural communities, or quite affluent communities like Byron Bay where they’re going to zero emissions within ten years and helping them do that across energy, land use, waste, transport and buildings, looking at different economic opportunities there. So that’s what the new organisation is doing. But I guess it’s one example of what’s happening all around the world with the new economy movement, which is called all sorts of things, solidarity economy, collaborative economy, sharing economy. People around the world are asking the question about how do we create economic systems that are good for people and the planet, that are socially just and ecologically viable, and what does that look like. So I went to Common Bound which is the New Economy Coalition’s conference and it’s just a whole bunch of people from around the States mainly, not many international people, talking about how they are putting that into practice. There’s a whole lot of different initiatives from energy cooperatives to alternative currencies through to the fair food movement through to really interesting things around fair and sustainable housing, different kinds of economic development. The thing about the States that really hit me is, it is a different context, so much more poverty and so much inequality, so it’s a given that something needs to change in the economy. And it’s a big thing in the election at the moment. That question of economic justice, like who owns the resources and how did we let it get to this point where there are so many people living in poverty and the environment is so screwed. So it was really interesting to be in that, and also the racial politics that came into that as well with the Black Lives Matters movement. In the US it’s probably more advanced than here, luckily in a way, because we didn’t have to confront those issues as much because we did have a solid welfare system and have had a solid welfare system in place and access to basic services. But there is a growing sense, particularly in regions and rural areas that that has been eroded and people have lost out on a lot and they can see what’s coming, they can feel what’s coming. Economically things are slowing down so we need to get ahead of that game and have a different story about what could be rather than thinking that this sort of inequality is going to keep growing and there’s nothing we can do about it, because there are things we can do about it. Clare: You’ve mentioned a couple of times now, how did we let it get to this? How did “we”, I assume the we is the people of world, how did we let it get to this, how did we let it get to this point where the kind of interests you mentioned before seem to run things while the things we need for a good life have been eroded? What’s your answer to that question? Amanda: As to how did we let it get to this? For want of not using jargon I think it’s the whole neoliberal paradigm, that we bought into the idea that markets could operate as this mechanical thing to make decisions and we don’t need Government to intervene in that, just leave it to the market. We know that the countries that didn’t go that way are doing better, where they’ve had welfare systems, they’ve had health and education pretty much free. I think that’s stopped it from getting that bad in Australia and in other countries as well. The countries where they have really adopted that neoliberal paradigm and the things that go with that are doing it tougher. You’re seeing a lot more inequality. Simon: I think it goes back to where we started this conversation around the theory and around the idea that the sort of diversity of economies that occurs, and that when we ask the question of how did we let it get to this there’s the different sorts of “wes” in that situation. There are “wes” in the powerful elite who have implemented a neoliberal agenda and then there are the “wes” in local communities who are either resisting that agenda or are engaging in other economic forms that are different to that agenda, and it’s worth thinking about the different sorts of “wes” in that process. You can argue that we voted for these parties but when all major parties sign up to the same agenda and you’ve got no actual choice, there is no choice in voting anymore and so it comes down to working in your local communities to engage in different forms and to resist in different ways. I think that it’s worth thinking the wes in that context and different sorts of groups. Amanda: How much power do we actually have? I remember, in the 1997 East Asian crash there was some really interesting research done that shows that people who were less integrated into the global capitalist system, so people who were still very much, they might have had a wage paying job in the city, but if they still had, their family as a group still had links in the subsistence and the informal economy they fared much better during that crash than people who were fully dependent on the capitalist system, where it was wage labour, they had to buy everything that they needed, they were outside of those other networks. So that was kind of lucky for them that they weren’t that fully integrated, that they hadn’t had that opportunity to have access that wage labour. So I think there’s different, like you said, is there a choice not to go that way. It’s also remembering how we’re not, like we still have options, there are still other ways in which we engage and produce and do things, so that’s my starting point. Are we that disempowered? And in Australia are we actually that badly off? I think a lot of the fear is perception that is not real. We’re still one of the wealthiest countries in the world, we still have systems that work for us, we can push back against those forces that want to privatise everything. For example in Queensland not all of our electricity system has been privatised, we’ve got an opportunity to lobby Government to get the renewable energy targets faster. So it’s breaking that down going where are their opportunities to intervene and to push, and who are we pushing? Who are we holding to account in that? Clare: I want to go back briefly to the discussion about the new economy movement with a couple of reflections. You talked a little bit about the diversity of groups involved in the Common Bound conference and the different social movements and organisations that came together there. It reminded me of some of the analysis that JK Gibson-Graham have and how they bought their feminist analysis into their work. Particularly the reflection of how the feminist movement of the 60s and 70s and 80s didn’t rely on any kind of centralised organisation to do what the feminist movement did. That it was this network of lots of different groups. I think they use the term “organisational horizontalism”. This spreading of things throughout the world. They use the phrase – “Ubiquity rather than unity was the ground of its globalisation”. I guess that is where there is some hope for this new economy movement. It is operating in a similar kind of way. Lots of different things happening all over the place, coming from a similar philosophy, or way of thinking, or way of seeing the world but really all spread out. And as you say whether the focus could be on any number of things but these things are popping up everywhere and then having the opportunity to come together. That is the first observation and I would like your comments on that but then secondly, I would like to know what you think the new economy movement looks like in Australia? Amanda: Totally agree with the comments. I think sometimes we get so hung up on a structural view of how it should look and what should be pushed but I think in any social movement – you look at civil rights as well – it starts with an idea around what is fair or that this is not good enough anymore, it can be different. Then what it looks like in different places is up to people in that place. There is a unifying idea but what it looks like and how people act on it is going to be different everywhere. What we have got working for us, that is different from before, is that we are more connected than ever before. So you are getting the impacts of the Black Lives Matter movement, which is very much focused on the US, but it is having impacts everywhere around the world and it is sparking a new conversation about decolonising ideas and decolonising democracy and different practices of decolonising the economy, decolonising the commons. We get these ideas that are really powerful that can spread and we can also share ideas about what is working in different places and get inspired by what is happening in Emilia Romagna in Italy about the re-emergence of the coop movement in a different kind of way. Or what is happening with alternative currencies around the world and digital currencies. What is happening with new forms of manufacturing that are popping up in Germany and France and what does that say for Australia. So I think it is a really exciting time to start thinking about how these ideas can spread and that people can take that and experiment with that in their own context, which is cool and exciting. But it means it is messy and it is hard to get our heads around is there something really happening or not, because if you isolate those examples out they look small and insignificant. But to me it is like mushrooms and we are getting mushrooms popping up everywhere and it is only with time that we will look back and go that was the time everything changed. But we are in the middle of it, which is why I think it is so important to be doing what you guys are doing which is articulating it and making it visible. We can actually see what is happening and that is where there is power, when you can actually say it is not just here, look what is happening here, here and here. And that is what I want to be doing with my new organisation because that is where there is hope and possibility. People can go – ok I am excited by that, let’s just try it, let’s experiment, let’s see what happens with it – and then link up with other people and share that example. I think there is real power in that but it is going to look messy. And in Australia – I came back from the States – it was like I had found by people in the States, found my tribe, really exciting, all these people doing really exciting work in these communities – and I thought now I have to go back to Australia. And then I came back and in Sydney we had a conference that was pulled together by Michelle Malony and Bronwyn Morgan (Bronwyn from UNSW and Michelle from AELA – Australian Earth Law Alliance). We had 130 people in the room from totally different organisations from all around Australia doing very similar work to what was happening in the States. We had people who had come through the social enterprise movement but doing really interesting things about makers-hubs and new forms of manufacturing and platform cooperatives and digital kind of stuff on the one hand. Then you had people who had come through the food movement over decades experimenting with the fair food movement and a fair go for farmers. Then we had people who were doing alternative currencies and exchange and different kinds of things in that way. So all sorts of different people in the room. So we have a tribe here. We are just starting to find each other and having that discussion about what that looks like. We will be repeating that conference in September of next year so if anyone is interested get in contact with me and I can forward the details on as we go forward with that. So we are just at the beginning of trying to figure out who we are and again it is messy. We are all going to have different view on what this is but we have to start somewhere. Clare: It is a really important point to emphasise that change is messy. It can’t not be messy. None of us can think we can control any of it, except for the bit we might be involved in. There is something really exciting about messy as well. There is something really exciting about the energy that comes from different groups trying things out and as long as we are not trying to tear each other apart or tear each other down while we are heading in the same direction then there is something good about it. I think we have to remember that the big things that happen in our world are messy and that is fine, because we are people. We are not robots. Amanda: The really important thing to remember in Australia – the question that remains unanswered for me – is do we have to wait until it gets as bad as it is in the States or as bad as it is in some parts of Europe like Italy, Spain, Greece for people to have to experiment, to find another way. Or can we actually empower people who are experimenting already and show where there is power in what they are doing. It is not just a last resort. We can start doing things differently. We can organise differently. How do we get that information out there? How do we build the capacity and confidence of people at a local level to just get on with it? It is happening but unless they know other people are doing it and can share resources then it is going to be a lot slower and a lot messier. I think we have got an opportunity like never before to, not necessarily make it less messy, but to actually put really good practices to grow and to spread and to take hold and to celebrate that. Clare: That is a big part of what your Next Economy project is all about. If people want to know more about that project or if there are ways to be involved, what are your next steps? Amanda: We are still in the process of launching. If people want to know about it, the best way is to log onto the Centre for Social Change website – www.centreforsocialchange.com.au – there is a subscribe button. If you subscribe you will get the latest updates on where the Next Economy project is at. Early next year we’ll be doing a speaking tour. We’ll actually be going out to capital cities and across regions to talk about what is happening in terms of an economic transition towards zero emissions in Australia, what we can learn from international examples, and what people can do in their local areas. Clare: Excellent! Amanda, that was amazing. Thank you so much for taking the time to Green Agenda. I found that a wonderful conversation. We wish you all the best with Next Economy and maybe we could talk to you again sometime. Also read Amanda’s previous contribution to Green Agenda on “Just Transitions”.